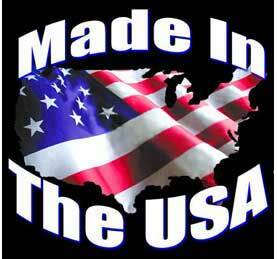 US Made gym mats, folding or mat rolls for exercise, gymnastics or martial arts. 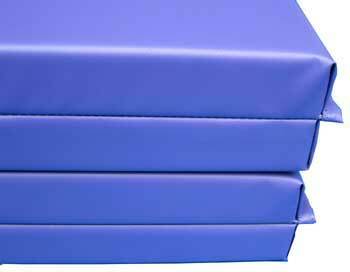 Rebound tumbling mats are available in varied thicknesses. 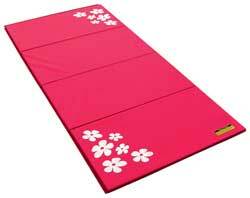 Gymnastic mats and judo mats are produced in 2 ft. wide panels which fold accordion style. Velcro on the short sides are standard and can make a long strip of tumbling mats. 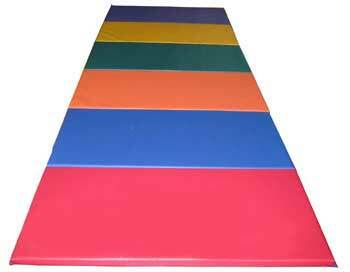 Gymnastics mats with Velcro on 4 sides can produce an area for free-exercise , martial arts and play rooms. 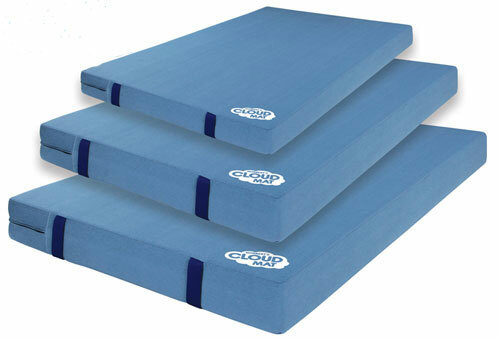 Gymnastic mats can also be hung on walls as wall pads. Carpeted cheerleading mat rolls is alternative to folding gym mats. If the space-saver folding gym mats does not meet your needs then Wrestling Mats Rolls is another option. What thickness should I purchase? 1-3/8� thick is recommended for general exercise, stretching, low impact aerobics, non-gymnastic play areas, etc. Two inch thick is recommended for tumbling, cheer leading, judo or other high impact activities like wrestling. 2-3/8" thick is recommended for power tumbling, cheerleading, judo or other high impact activities like wrestling. The advantage of the 2-3/8" thick mat is better rebound, more energy absorption and less stress on the joints. If you budget permits, we would rather be a victim of a judo throw on a 2-3/8" thick judo mat than a one inch thick judo mat. Which is better Cross link (polyethylene) foam or Poly foam (polyurethane)? 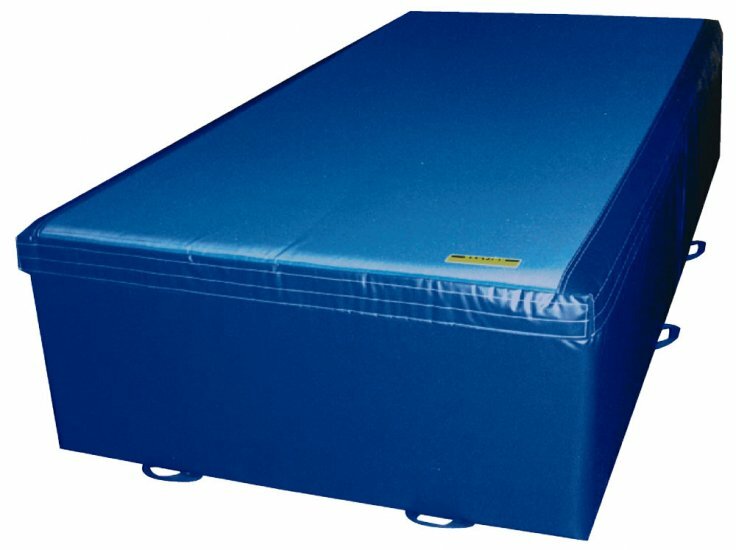 Cross link (Polyethylene) Cross link is the world standard for gymnastics mats, martial arts mats and tumbling mats. It's a firm closed cell foam that has great rebound capabilities, durable and light weight. This is recommended for serious tumblers/gymnasts/martial artists and wrestlers. Poly Foam Poly foam (Polyurethane)is an open cell foam with poor rebound capabilities but with quality shock absorbency. Polyurethane may be more suitable for exercise mats for fitness, sit ups, etc. Polyurethane is softer than polyethylene and will minimize injury more than cross link. Poly foam will provide a safer landing surface for kids 3-8 years old, esp. for basic tumbling skills and movement education. 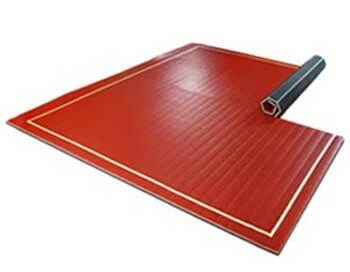 Rubber Aerobic Mat Rolls Cross link foam is suited for aerobic activity. For a firmer, more durable gym floor, half inch thick black rubber aerobic floors is an option. 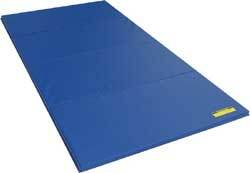 Our Royal Blue gymnastic and tumbling mats are the most practical color. Scuff marks are less visible and they don't show the dirt as much as Rainbow mats and light-colored gymnastic mats. Match your school colors with alternating color gym panels. 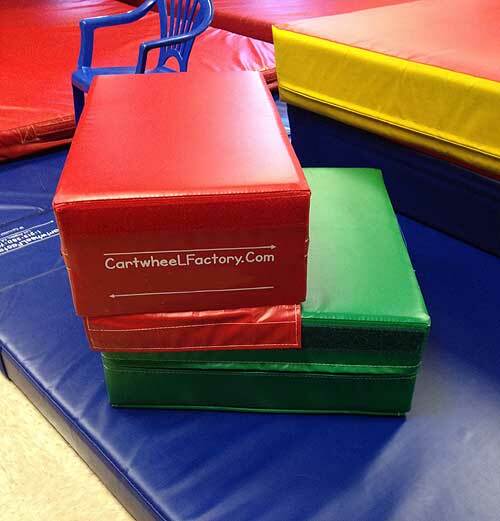 Cartwheel Factory gymnastic mats have twelve color options to choose from with any color combination. CWF�s exercise mats for fitness are the most comfortable, actually, most luxurious fitness and exercise mat on the world market. We�ll describe the exercise mat as gel-like, but it�s not made of gel; it�s not spongy, the foam core is too closed and tight; it�s not a memory foam exercise mat, it rebounds too quickly. Then what is it? Simply, the most comfortable exercise mat ever designed! Size : 6' x 2.5' x 5/8" 4' x 2' 2" x 5/8"
Note: Discounts are provided for high quantity orders. E-mail : Sales@CartwheelFactory.Com for discount details. If you enjoy rebound then CWF Flooring, Inc's. 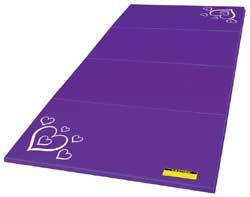 power tumbling mats will enjoy you! If placed on concrete or wood floors you'll still have an impressive rebound. If you acquire gymnastic springs under the tumbling mats then get ready for serious rebounding. In addition, to the added rebound, these tumbling mats will minimize premature joint wear and tear and most importantly will minimize injury. No gym mat, tumbling mat or even a 32" thick stunt mat can PREVENT injury! The key to minimizing injury is using the appropriate mat thickness and size and proper gymnastic strength training. (1-3/8" Cross link over 1" High Rebound 3570 Polyurethane Total Thickness 2-3/8"
Note: Discounts are provided for high quantity orders. Sales@cartwheelfactory.com our sales dept. for discount information. 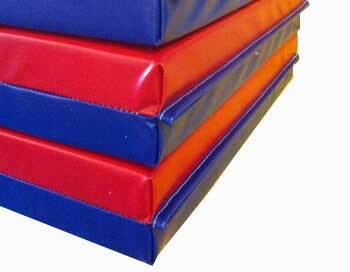 All four of the above 4 ft. x 8ft x 1-3/8" thick folding gymnastic mats ship in 2-5 days! This exercise mat and gymnastic mat is suited for a variety of activities; exercise, stretching, jump rope training and of course one can use it as a gymnastic mat. If the user is more than 100 lbs. 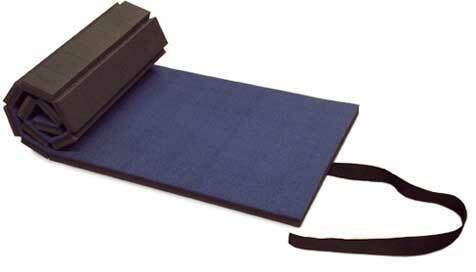 or doing back handsprings we suggest the 2" thick tumbling mats. The vinyl is stain resistant for most liquids so this can be used as a play mat in front of the TV. Need not worry if soft drinks are spilled on this gym mat. The vinyl is easy to clean with a damp sponge. Since this mat folds, it's easy to store under beds. A 4 x 8 x 1-3/8"gymnastic mat, when folded, measures only 4 x 2 x 5-1/2"
This mat can be used for numerous athletic activities; like power tumbling, judo, wrestling and exercise, and if mounted on the wall can work well as a wall pad. The 2" mat is NOT as 'bouncy' as a power panel tumbling mat. Made of solid polyethylene. 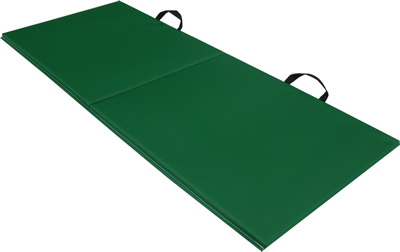 This Polyurethane Folding Panel Mat is two inches thick are designed for basic low-impact activities like beginner tumbling and movement education. Polyurethane, an open cell foam-fill, is softer than the above crosslink mats. The softness of this mat will minimize injury more than crosslink but does not have the rebound capabilities of crosslink for advanced tumbling. Do not use as a judo mat because these mats will 'bottom out' on judo throws. Also available are one inch thick textured interlocking foam tiles, also known as: Puzzle Mats. Folding gym mats Ships in 6-7 weeks. Free Shipping. This is the ultimate gym mat! Of all the mats this is what I would like to be thrown on, rebound from or land on. This gym mat is produced with two types of foam a spongy foam which reacts as a cushion and the cross link that produces rebound. That's why martial artists, tumblers and gymnast flip over this mat. 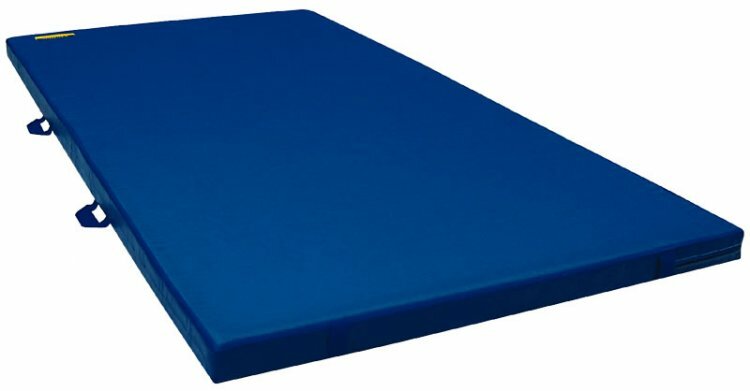 Power Panel Mats (2- 3/8" thick) are designed for high- impact activities like advanced tumbling, stunt work and judo throws, etc. The extra thickness will reduce minor injury, soreness and joint pain. The rebound for the Power Gym Mat is superior and SAFER! Ships in 6-7 weeks. Free Shipping. 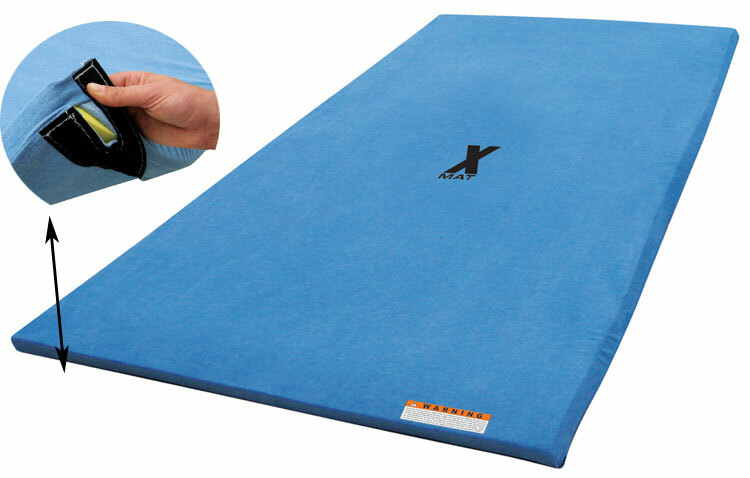 This target-like judo mat and gymnastic mat provides a reward for landing on the 'X" This is the X- Mat. Covered with smooth to the touch faded blue denim with a 90 ILD 3 lbs. 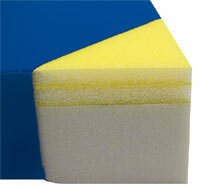 rebound foam filler. X- Marks the spot! This is not a water resistant mat. NEW! Covers feature Velcro closure for easy washing and foam replacement. Solid non-layered foam gym mats provide gymnasts, stunt men and stunt women an absorbed landing from gymnastic equipment martial arts throws or stunt work. Produced with handles for easy portability. Designed to be used on top of other mats to avoid "bottom-out" landings. Made of poly foam with a soft blue denim skin. 3' x 4' x 4"
4' x 6' x 6"
E-mail Us At: Sales@CartwheelFactory.com our sales dept. for discount information. Intended for use as an additional landing surface for practice and/or competition. Cover consists of mesh breather top and 18 oz. 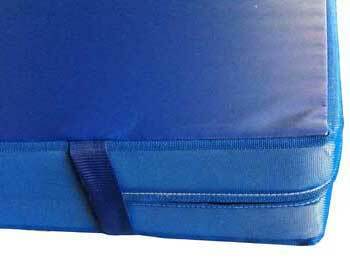 coated vinyl sidewalls/bottom with 2" nylon webbing handles on sides and ends; all seams are double stitched. Filled with prime 55 ILD polyurethane foam selected for its energy absorption properties. Throw Mats are the same in appearance as the below Landing Mats. Color Options: Royal Blue, Red or Green. 1. Throw mat for gymnastic 'crashes' and martial arts throws. 2. 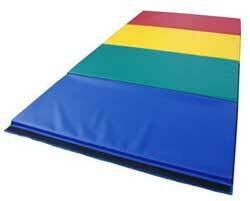 Landing mat for feet first landing off of gymnastic equipment. Firm foam material consists of polyethylene; softer absorbing foam is polyurethane, aka. poly foam. CWF Flooring, Inc. Gymnastic Landing Mats are designed for gymnastic competition & martial arts training. 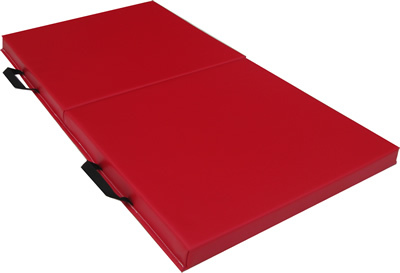 Manufactured with a dual layer of poly foam and cross linked closed-cell foam will provide secure foot landing. The firmness of the polyethylene will minimize the twisting of ankles and knee joint upon landing. As well, the under-core of softer poly foam will assist to minimize the ballistic jarring of the joints upon landing. There is no gymnastic mat design or thickness that can prevent injury. Upholstered with 18 oz. vinyl and velcro attachments for in-line connections. Ships in 6-7 weeks. Colors: ROYAL BLUE (standard) RED, YELLOW, LIGHT BLUE, ORANGE, GREEN, MAROON, GREY OR BLACK. E-mail Us At: Sales@CartwheelFactory.com for details. Our yoga mats and Pilate's mats are commonly used in yoga and Pilates studios. Higher quality than the poorly constructed mats you find at sporting goods stores. With A firm 5/8 inch thickness the yogi will maintain balance and equilibrium while maintaining comport. Carrying case included. size : 2' x 4' x 5/8" 2' x 4' x 1-3/8" 2' x 4' x 2"
size : 2' x 6' x 5/8" 2' x 6' x 1-3/8" 2' x 6' x 2"
GUARANTEE: Our American-made athletic and gymnastic and exercise mats have a two year warranty against defective manufacturing and defects. CWF Flooring, Inc. will replace at our expense any defective parts. This warranty does not include extreme abuse as this is not considered a defective product or poor workmanship. CWF Flooring, Inc. will not apply this guarantee if equipment or mats are improperly used or installed.